Soundproofing a space in the home appears to be an excellent solution for owners of dogs with thunder phobias. But there’s a problem. Sound waves for low-frequency noises such as thunder, booms, and other rumbling sounds are very large. That puts significant limits on what can be achieved with normal soundproofing materials. Thunder sounds typically range in frequency from 40 Hz to 120 Hz. Dogs usually hear down to about 60 Hz, so let’s take that as an example. 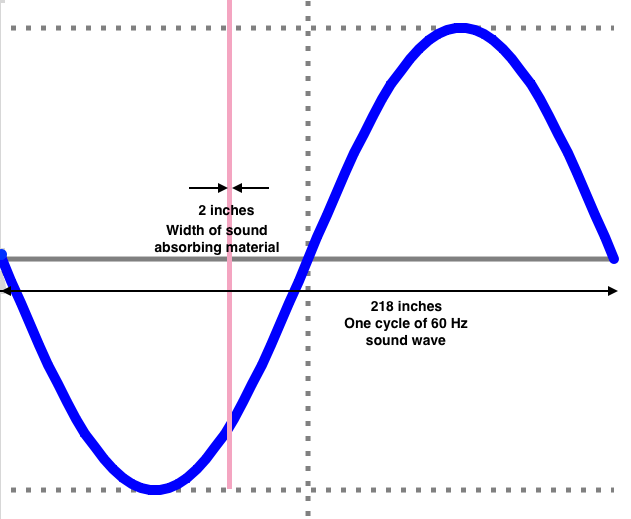 One cycle of a 60 Hz sound wave in air is 18.15 feet (217.8 inches) long. Sounds waves are longitudinal waves, which are hard to draw and visualize. But sound waves can be rendered as transverse waves to make them easier to conceptualize. The video below demonstrates the difference between the two types of waves. Rendered as a transverse wave, one cycle of our 60 Hz sound wave frozen in time could look like this. Remember, this wave is over 18 feet long (about 218 inches). So if we add our two-inch barrier to the diagram to scale, it looks like this. Pretty skimpy compared to the wave, yes? Acousticians refer to small objects and barriers as being “invisible” to large, low-frequency waves. The waves pass through and around them with virtually no absorption. Soundproofing materials would have to be massive (larger than the sound wave) to have an effect. When sound encounters an object, typically some of the sound is reflected, some is absorbed, some is transmitted (passes through), and some is diffracted (goes around). Transmission and diffraction are both highly dependent on frequency. Low-frequency waves pass through barriers without much absorption. They also pass around obstacles. When the obstacles are small compared to the sound wave, the waveform is not affected much by the obstacle and re-forms after passing by. Different materials have different absorptive qualities. Acousticians and engineers have computed these differences and grade them with an absorption coefficient. Absorption is an official technical specification for many building materials. Perfect absorption (not generally possible) would have a score of 1.0. But the absorption capability varies with frequency. High-frequency sounds with their smaller waves are absorbed much more easily. When someone is playing loud music in their car or apartment, what we hear the most of is the thumping bass. If you go to a movie metroplex with multiple theaters, what you typically hear from the next theater are the rumbles and booms. You would not usually be able to hear a person yell from a mile away, unless they were on a lake or a very flat expanse, say in the desert. But we can hear thunder from more than 15 miles away. It’s not just the amplitude (loudness). It’s the low frequency. Also think about the difference between thunder nearby and farther away. If it’s close we hear a variety of frequencies including the crackle of lightening. But we lose that at longer distances. We hear only the rumble. What Happens To the Sound? When you do hear thunder, think of all the objects between the thunderclap and you. The sound wave is large compared to the obstacles it encounters when traveling. Depending on the terrain and angle, it has probably passed through and around trees and buildings before reaching you, not to mention passing through the walls of your own house. You can even hear it underground in your basement. So why would we think that two inches of absorptive material would create a thunder-proof enclosure? It doesn’t. Remember the absorption coefficient, where complete absorption is a score of 1.0? The absorption coefficient of two inches of excellent sound absorbing material is about 0.1 for a 60 Hz sound wave. That means only 10% of the sound is absorbed and 90% passes through. In comparison, a referee’s whistle is typically about 3,500 Hz. 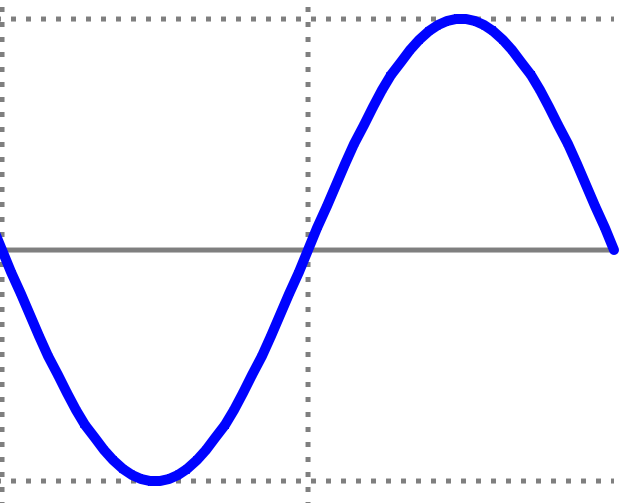 That wavelength is around 4 inches and the same absorptive material has a coefficient of 0.94 at that frequency, meaning 94% of the sound of the whistle is absorbed and does not pass through. Charts for absorption coefficients of soundproofing materials generally start with 125 Hz as the lowest frequency. That’s because it’s understood that even the best materials can’t absorb lower frequencies, for the reasons I’ve described. Architects, civil engineers, and sound technicians know not to try to use them for that purpose. This article does have an absorption chart that goes down to 50 Hz. Take a look at the first graphic. The green line represents the thickest absorptive material at two inches thick. The x-axis (horizontal) represents frequency. The y-axis (vertical) is the amount of absorption. What happens to the green line to the left of 250 Hz tells you what you need to know. The low frequency sound is not significantly absorbed. So the next time you read the recommendation to use a product that uses insulation-type soundproofing (also called passive sound control) to protect your dog from the sound of thunder, you know to be skeptical. Such a material could help with high frequency sounds, but you have plenty of materials in your own home already (such as doors and blankets) that can do that. It won’t help much with thunder or fireworks with deep booms. A better option for reducing low frequency sound in general is active noise control (sound cancellation). But to my knowledge it has not yet been effectively applied for dogs, despite some product claims. I’ll discuss that in a later article.